Sample tweet: "The Grinch Who Stole My Virginity #HigherStakesChildrensBooks"
Stand-up comic Patton Oswalt's acerbic observations are best served live. But one can get a taste of his spot-on thoughts on modern culture through his constant Twitter updates. 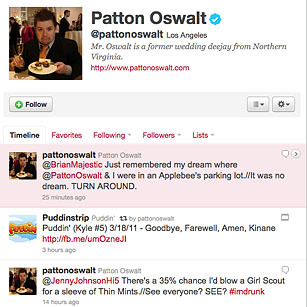 Oswalt not only chimes in on trending topics and posts short jokes, but also frequently retweets his fans, sharing the spotlight with his funniest followers.